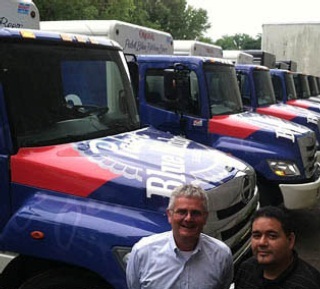 Oak Beverages, Inc., which services the New York Metro area with an impressive portfolio of beer, wine and spirits, recently rolled out its new Pabst truck bodies from Mickey featuring full “cab wrap” decals. “This is the first use of a cab-wrap decal on a beverage truck that I’m aware of,” says Gary Remley, Mickey’s Northeast Regional Manager (left in photo). Adds Patrick Bracho, Oak Beverages Fleet Manager (right in photo): “It’s gorgeous. You can’t tell it’s a decal.” Oak Beverages, celebrating its 111th year, is part of the Boening organization and runs 42 beverage trucks out of 2 warehouses.